TAKE SEFTON PARK MEADOWS OFF THE LIST! LCC WITHDRAW 19 SITES FROM LIST OF PROPOSED DEVELOPMENT SITES. SEFTON PARK MEADOWS NOT WITHDRAWN – YET! Liverpool City Council have confirmed that, as the landowner, they have decided a list of 19 sites do not constitute viable or deliverable options for development. This follows assessment and evaluation of the sites and they will now not be considered as potential development sites in the Local Plan. Virtually all these reasons for sites to be withdrawn can be applied to Sefton Park Meadows. 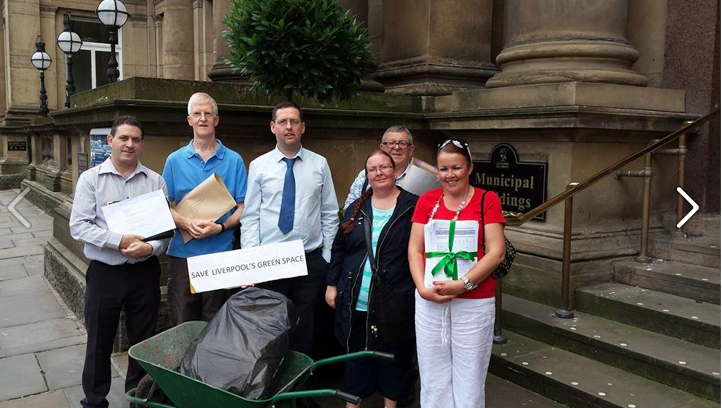 Save Our Greenspaces Liverpool (SOGS) handed in city council surveys completed by park users as part of campaign. 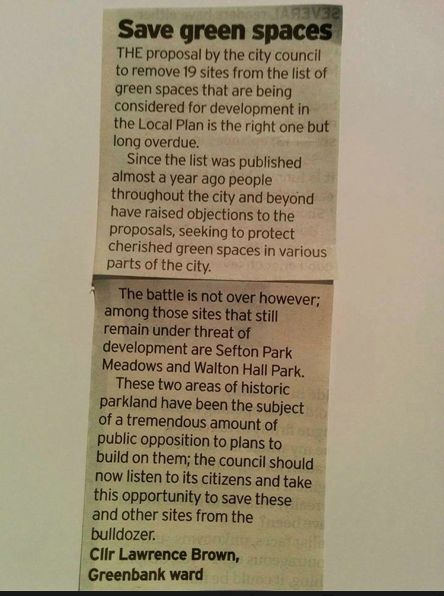 Interesting to note that in an earlier online version of the Liverpool Echo article it mentioned the fact that Sefton Park Meadows has not been removed from the Council Local Plan list, despite the prolonged, vociferous and well supported campaign against the proposed sell off. The later printed version omitted to mention this 2 and a half year campaign! The 19 sites removed from the Council Local Plan list have achieved this with minimal to nil campaigning and publicity compared to the two and a half year long sustained and justified campaign to Save Sefton Park Meadows. How did that happen? The Reasons for Sites to be Withdrawn given in the report on page 108 pale into insignificance when compared to the dozens and dozens of reasons/constraints that exist, and have been communicated in great detail to Liverpool City Council, to protect Sefton Park Meadows from any building development. So why are Sefton Park Meadows not the 20th site on the list of sites removed from the Council Local Plan list of proposed development sites? See this letter from Cllr Brown, Greenbank Ward in Liverpool Echo 29th Aug 2015. WE WANT SEFTON PARK MEADOWS TO BE TAKEN OFF THIS LIST NOW. WE HAVE MORE THAN PROVED THE CASE WHY, AND THE EVIDENCE IS CLEAR. We will be updating on Facebook and the website with more details. Thanks to everyone who came to chat and complete the council’s Parks and Greenspaces Users questionnaire in Sefton Park today (16th Aug). There’s so much support out there for the Meadows and Liverpool’s greenspaces! If you took away a questionnaire to fill in, don’t forget to send it in – if you intend to do an online survey, please do it now! AND tell friends and family. Deadline is 28th Aug.
An update came in today from the National Federation of Parks and Greenspaces. Sign their petition too, link below. 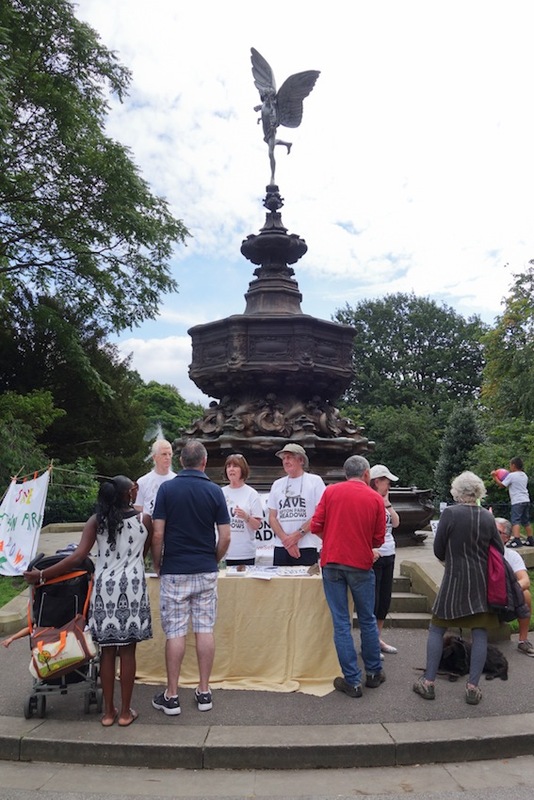 We are pleased to report that tens of thousands of people took part in this year’s Love Parks Week, July 24th to August 2nd 2015, the annual UK event to promote, protect and improve our vital local public green spaces. As World Parks Day approaches on Saturday September 19th we call on all citizens to continue to speak out for our parks and green spaces as they face an ever-deepening underfunding crisis and increasing threats of development. The Government’s cuts to Local Authorities for our local public services, combined with the lack of statutory protection for open spaces, are causing the most of the problems we are facing. This is provoking a growing number of vociferous and inspiring local grass-roots campaigns and petitioning as local communities mobilise to defend spaces under threat of neglect, privatisation or sell-offs. At the same time the evidence continues to stack up on the vital and unique role our parks play for health, biodiversity, flood control, climate change mitigation, social cohesion and many other essential needs of all sections of all our communities. 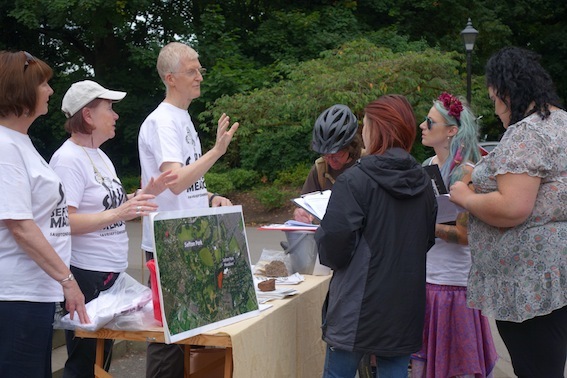 Following pressure from UK green space organisations including ourselves, the previous outgoing administration recommended that the newly elected Government consider hosting a National Inquiry into the future funding and management of our parks. Also, a cross-party group of MPs is now calling for a Private Members Bill [Bill 53] to strengthen protective measures. So please sign and promote the UK ‘Save Our Parks’ petition to step up the pressure on the Government and all political parties to take seriously the future funding and protection of our vital green spaces. 5. Join the many others including Groundwork (green space volunteering charity), Fields In Trust (national open spaces safeguarding organisation backed by the Royal Family) and UNISON (Local Government workers union). Let us know. And please don’t forget to support your local green space Friends Group or help set up one for any green space without one!